Ever since HfS bought the topic to the attention of stakeholders back in 2012, the robotic thrum of RPA throbs louder and louder. With the conference circuit over-flooded with more and more RPA conferences, robotically repeating the same rhetoric, the actual RPA deployments are significantly scaling up and M&A in the space is gaining momentum. Yet, true meaning and definition of what truly constitutes “RPA” are as blurred as ever, as more people jump on the bandwagon who couldn't define cognitive vs digital vs autonomics, if their job really depended on it. Enough reasons to take stock where this industry is at, and add some definition and clarity to this fuzzy world into which we're stumbllng. With that in mind, we asked our analytical Automation Overlord, Tom Reuner, to talk to the industry’s stakeholders who buy, sell, implement and generally go nuts over this stuff... and take a fresh look at the market dynamics. So, Tom, amidst all this noise what is really going on in RPA these days? Noise is a good way of describing it, Phil. Yet, underneath the surface, we are seeing clear signs of maturation. This maturity manifests itself in different ways. The pace of change in which the suppliers are building out automation capabilities is nothing short of astounding. Most providers are embracing a holistic notion of Intelligent Automation ranging from RPA to Cognitive Computing to AI all the way to self-learning and self-remediating engines. However, we must be careful not to confuse building out capabilities with traction in the market. At the same time the leading tool providers such as Blue Prism, UiPath and AutomationAnywhere are expanding their capabilities mostly toward operational analytics and the broad notion of cognitive. Lastly, buyers demonstrate a much more solid grasp of the implications of RPA, both on the technical side as well as around the business implications. Mature sourcing organizations are starting to build out automation centers of excellence cutting across business units and automation technologies. Thus, the tool-centric discussions (often a pure tick box exercise) of the early RPA days are getting less and less. However, despite all those positive developments there continue to be constraints. The key one jumping out is the scarcity of talent. Putting a bot into a process is not too difficult. Scaling them up to an industrial level and having both the technical know-how and process knowledge is quite another thing. It is here where the differentiation between the various providers is starting to crystallize. What has really changed since the last HfS RPA Premier League Table? Really all change, Phil. The 2015 RPA Premier League Table was a reflection of a still nascent market. At the time, Charles did a great job of benchmarking providers against the HfS Maturity Model, but invariably the emphasis was still strongly around the strategic vision and the effectiveness of the market communication. In 2016 the market has strongly progressed toward understanding and applying RPA as transformation projects. We are finally starting to overcome the early misconceptions that RPA is a turn-key solution, non-invasive, low risk and largely focused on replacing FTEs. Not least from many failed projects the market has learned that, unsurprisingly, life is much more complex. Underlining this point, RPA tool providers have progressed to push notions of virtual and/or digital workforces. Equally, RPA increasingly is seen as part of an automation eco-system rather than a silver bullet. As a direct consequence, the market is becoming increasingly bifurcated. The leading providers that are heading the 2017 iteration, are positioning RPA as transformational projects. The process owners have been put back center stage and discussions focus on the whole continuum of Intelligent Automation rather than just RPA. Aligned with that data curation is becoming increasingly a focal point as organizations are advancing toward the As-a-Service Economy. With that, we are seeing the rise of the Big 4 but also organizations like Alsbridge who is expanding from broader sourcing advisory. However, the other half of the market remains stuck in understanding RPA as a placeholder for short term cost take out, task automation, often on a sub-process level and often without the knowledge of the process owner. Lastly, M&A is accelerating with Pega having acquired OpenSpan and just this month ISG acquired Alsbridge. And the market is rife with rumors about more transactions. In our view, M&A is a strong benchmark for increasing maturity as money talks louder than PowerPoint. So Tom, what was your methodology behind putting together the 2017 RPA Premier League Table? Not beating around the bush, who is standing out as RPA performer? Phil, the leading providers are blending a holistic approach to automation with broad transformational capabilities. Top of the tree is Accenture who is complementing its consulting capabilities and a plethora of third party tools with its new proprietary Accenture Robotics Solution. The solution is modular and able to integrate optional technologies for each client, for example, by using Google or Facebook APIs when needed. Deloitte is the strongest riser in the RPA Premier League Table by pushing a holistic transformation agenda. Cognizant’s automation team within the Emerging Business Accelerator (EBA) is at the vanguard of educating the market place on the implications of automation. Close behind the leaders is EY and TCS. EY has embedded its RPA approach into the broader Smart Automation Framework with a strong focus on transformational projects helping clients to move toward self-service and CoEs. Conceptually, EY is moving toward the notion of the OneOffice. TCS’ RPA approach has significantly matured, in particular by embracing a hybrid tool strategy and by focusing its go-to-market around nuanced use cases. However, the context is by no means just BPO centric scenarios. Atos and Capgemini are examples for driving RPA tool sets into application management scenarios. Alsbridge stands out as one of the few sourcing advisors, and the only one with a global presence to expand its capabilities into RPA implementations. These capabilities were a key consideration for the acquisition by ISG. Gazing into a crystal ball, what can we expect for 2017? If I would have all the answer, Phil, I could make a lot of money. But on a serious side, two issues are standing out for me. First, M&A will accelerate and disrupt the market. Following on from the acquisitions of Alsbridge and Automic, leading tool providers as well as the leading pure-plays are likely to be absorbed by acquisitions of the next 18 months. This might lead to more proprietary tools being developed, both to mitigate those risks but also to allow for broader functionalities. At the same time, go-to-market strategies have to be adapted as the large management consultancies will play an increasingly dominant role as RPA deployments will pivot around transformational projects. Second, the rise of Virtual Agents. We will see increasing traction of virtual agents that will fundamentally change the notion of service agents. These deployments will push more holistic automation approaches while disrupting workforces. Thus, these agents will increasingly offer broad management capabilities such analytics and integration capabilities for code and files. Therefore, the focus will shift toward enabling a seamless customer journey underpinned by broad knowledge libraries, dynamic case management and above everything else NLP. Thus, RPA will have to be part of ever more holistic automation approaches. 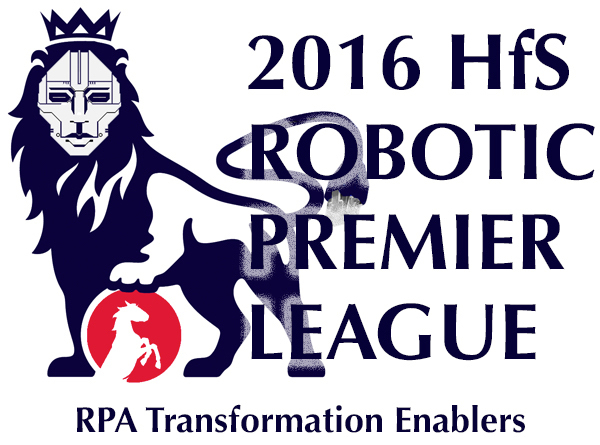 HfS subscribers can click here to download their freemium copy of the 2016 RPA Premier League table and analysis, authored by Tom Reuner and Phil Fersht. Hi Phil/Tom - any particular reason you asked Blue Prism, Automation Anywhere and UiPath on their perspective of the partner eco-systems? You mention they are the leading tool providers what is this based on i.e. them being first to market, no. of clients, year on year growth, innovation, total revenue etc? This is spot on, in my opinion. The Big 4 firms are all over the RPA opportunity as this market explodes! Great job as always guys! Why aren't you at IRPA? Good analysis and insight, hope there will be an analysis on how captive SSCs are leveraging RPA and rankings. Happy to see Cognizant ranking top 5. This is a very accurate reflection of the RPA implementation space form my experience. Great post. One theme I picked from this is the need for a holistic approach especially when the tech landscape is fast changing. However I am disappointed to see many sourcing office leaders fall into the trap of buying a tool thinking it will world change the world. Phil, One thing we've struggled with is really where the rubber hits the road in terms of credentials. There are a lot of good innovation "stories" around RPA but several of the players on your list have really struggled to articulate savings and examples outside of their own in-house improvements using macros in excel. When do we expect more maturity in this space in terms of client stories that the rest of the industry can get behind? It's early in the morning, the filters are off so I'll just answer your question as bluntly as possible: We live in ignorant times - people are blindly groping for that next vehicle to drive out cost, and RPA currently fits the bill. I, personally, thought the hype would die down this quarter as companies struggled to figure out what not to automate. Don't get me wrong, the RPA value proposition is tremendous - taking high throughput, high-intensity processes that require large amounts of unnecessary manual intervention and digitizing them to free up thousands of man/woman hours, is a terrific way to add value to a business. But RPA is a murky, weird, and very complex, technical world - you need people with good process knowledge (not too hard to find), you need people to help evaluate what to automate in the software that makes business sense (you can't automate everything or you'll forever be automating and forever be spending money on automation) and you need technical folks who can help integrate the software behind the Citrix firewall in enterprises, who understand complex APIs and security issues. You also need a skilled change management plan as the "robo" paranoia can make the old offshore paranoia seem like chicken feed. Then you need some serious robo-governance competency... and these people are really hard to find. You can't train your 28 year old MBAs to be robo-governators - these need to be your battle-weary operations leaders who know how to balance politics, panic, understand enough about tech to be dngerous, and can communicate the bloody stuff to leadership and middle management. So to conclude, we will need some time before the true excel-proven results really materialize - and many firms will forever struggle to metricize the true ROI of RPA down on paper. It's a bit like ERP 20 years ago - did anyone ever truly prove the ROI from huge investments in SAP or Oracle? It just became "assumed" that you couldn't run a business effectively without and ERP system. In a couple more years, we'll just assume you can't run a business properly if you haven't retro-fitted RPA into your down and dirty business processes to make some of them run better. So most people associated with outsourcing and shared services are now aligning themselves in some way with RPA - the advisors are shaping up to make their clients look like they have a plan, the providers are working hard to make it look like they have RPA firmly embedded in their capabilities, and many savvy buyers are slapping RPA somewhere in their job title / job description. But the true answer to your question - "when will we see more client stories the industry can get behind"? Simple - when the hype finally fades and those firms that made the smart investments finally put their experiences to print, unafraid to talk about how they improved their business with smart automation software. And this can take years - moving processes into software is a significantly more challenging exercise than moving them to lower cost people half way across the world. One other issue, Steve, is the paranoia and reluctance of buyers to talk openly about their automation initiatives. Automation is being treated with a much more heightened degree of sensitivity than we ever saw with "outsourcing".